I joined a 5-day/4-nights tour group to Malaysia, a country that I had never been before. From Hong Kong to Malaysia then back to Hong Kong, I either closed or covered up my eyes (in order to pretend that I was blind) for the entire journey. During the trip, I was still doing all the sightseeing and took many photos, but instead of seeing, I only used my body to sense and experience my surroundings. These photographs enabled my “future” eyes to view the documented foreign landscapes at a later stage. 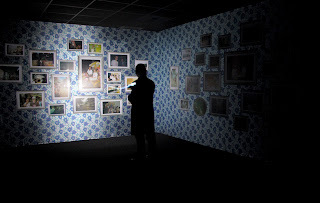 My images, along with photography and videos from other members of the tour group, became the sole reference of my indirect memories and visual experience for Malaysia. I will never step foot into Malaysia again. (#2) A Travel without Visual Experience is totally included 19 rolls of photographs, in 4 groups. These 5 rolls (#2) are Tate Collection, presented by Richard Chang 2010.